Jessie Pinkham has read 14 of 70 books. Jessie Pinkham read 70 books of their goal of 60! Jessie Pinkham read 48 books of their goal of 40! She's usually writing more than one new book at a time, and frequently rushing out at the last minute because she got lost in her own fictional world. 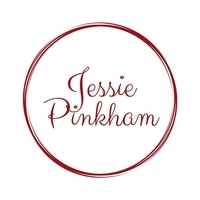 To ask Jessie Pinkham questions, please sign up. ... and I'm determined to finish a new story. What I like about Camp NaNo is that, unlike NaNoWriMo where you're supposed to write a 50,000 word novel in a month, for this event we get to set our own goals. I have no idea how long this will be. Probably in the short story-novellete-novella range. I just want to finish it this month. This is less a romance and more a paranormal mystery with a romantic subplot, which I knew from reading other reviews. I'd saved it for a time when I was in the mood for that, and today was the day. Overall, I thought the writing was good and the pre This is less a romance and more a paranormal mystery with a romantic subplot, which I knew from reading other reviews. I'd saved it for a time when I was in the mood for that, and today was the day. Overall, I thought the writing was good and the premise interesting. The jumping between past and present, which can be hit or miss, worked well. I was fully on board with the mystery, and if all the major characters were amazingly successful for people in their late 20s, I was willing to let that slide. The ending knocked the book down to barely 3 stars. I found the culprit predictable and the romance was just too perfect without ever dealing with serious issues. ("Yes, I know you thought my brother was a murderer for the past 12 years and hated me for believing in his innocence, but that's water under the bridge." Not an actual quote. We’d love your help. Let us know what’s wrong with this preview of The Well by Marie Sexton. We’d love your help. Let us know what’s wrong with this preview of My Fair Captain by J.L. Langley. Pros: Adorable bus romance. Great supporting character in Angus. Love for Deep Space Nine. Cons: Sometimes got a bit like reading a textbook or website at the ace/aro support group meetings. Hennessy was a little too perfect where Jordan was so quirk Pros: Adorable bus romance. Great supporting character in Angus. Love for Deep Space Nine.